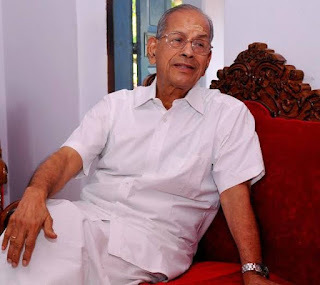 Musings 'n scribblings of a philanthrope .. : E Sridharanji ..
A legend hangs up his boots On the last day of this month (in 2012/13) Finally, Elattuvalapil Sreedharan has been allowed to retire, at the age of 79. A man who built the Calcutta Metro, Konkan Railway and the Delhi Metro. But he is best remembered for re-building in just 46 days the Pamban bridge which in 1963 was blown away by a cyclone into the sea. Here is a man who is honest to the core, brooked no nonsense and set an example for others. A true leader who walked his talk. He truly deserves the Bharat Ratna. Now he is going to Kerala to fulfill the dreams of Mallus "The Kochin Metro "
India has much gratitude for this great engineer. 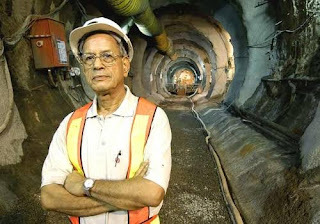 He is known as the The "metro man of India". He is quite a sensational project manager, who almost always gets the project completed on time or before schedule. He fought all the delays caused by bureaucratic red tape, corruption and lack of funds. 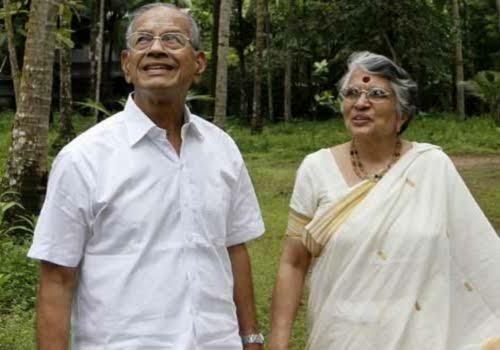 Sreedharan's willpower has moved mountains. He is not just a dreamer but also a builder, but most of all, one who has dedicated his achievements to every Indian. He stands out as a legend in Indian Engineering history. His major projects being the Delhi Metro and the Konkan Railways. This 75+ year-old Managing Director of the Delhi Metro Rail Corporation only desires the progress of his country. He wanted Delhi to have a world-class metro rail project to change the meaning of urban transport in India. And he did it. The Konkan Railway project came to him in his retirement. It was a challenging task----760 km of rail tracks from Mumbai to Kochi through the rugged hills of the Western Ghats. This project was found as not feasible, by the British engineers in pre-independence era. But for Sreedharan nothing was impossible. Environmentalists protested, politicians said it cannot be done and the project ran short of money. Sreedharan raised public bonds to finance it, taking everyone ahead. Kiran Bedi explains why Sreedharan is worthy of the title: "He is not in his 40s or 50s, but he is in his 70s, a time when we normally retire. 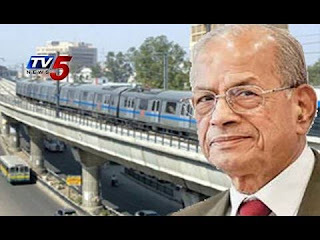 Sreedharan has given the best metro concept for the railway of the country with integrity, vision, with commitment and with remarkable professional skills. There is no other person better than him in this category." Sreedharan insists he does not have any special skills to get the best out of people. "I always found that people cooperate if you work for a good cause," he says. Sreedharan studied in an ordinary school & college and later on took his civil engineering degree from a govt engineering college. But he went on to become the boss for hundreds of IIM, IIT graduates! So dedicated and disciplined ..
People still wonder what really makes him tick at 80 while a young man in his 20's struggles to begin his day at 6 or 7 in the morning. Sreedharan's day starts at 4 am, meditation and Bhagwad Gita. He reaches office at 9:30 am and gets straight to work. In the evening, he usually takes a long walk with his wife Radha and allots time to his family of four children. He used to set up reverse clocks to show impending deadlines to his project members during Delhi Metro construction phase. The message of the Gita: To act, without desire for the fruits of the action gave him the courage to act. A plate placed in his Kerala office read as: 'Whatever to be done, I do. But in reality I do not do anything'. India says thank you sir. In native attire in his h0me town Pattambi..
Government of India may or may not award him the Bharat Ratna. But for the countless millions that have travelled on the Pamban bridge, Kolkata Metro, Konkan Railways and Delhi Metro and for the knowledgeable public he is already a Bharat Ratna - a real gem of the rarest variety. The GoI confers Bharat Ratna on worthless people. He is much above Bharat Ratna (along with Dr. Varghese Amul Kurien, Vikram Sarabhai and Homi J Bhabha). Not over !! After getting retired from GoI at age 79, he was not spared by other metros where he continues to be Advisor particularly in Southern States. Now at age 82, he has been invited by Ban ki Moon, UN Secretary General to be the Advisor for Sustainable Transport to the UN for 3 years which Sridharanji has accepted. Busy till age 85 ! !